See the famous tulip fields of Holland by car - the best way to enjoy the tulip fields! The view of the tulip fields from my window seat. It’s always a treat to fly into Amsterdam Schiphol Airport in the spring as you’ll have the chance to see the flowering tulip fields from the air, provided you book a window seat of course! It was no different when I flew back home recently. The view of the tulip fields around Lisse was simply stunning! As the plane made its final approach into Schiphol Airport, I noticed other flower fields to the west of the Polder runway. I made a mental note and decided to go for a drive around the tulip fields the next day. I started out by driving along the A9 highway towards Haarlem before turning off the highway in the direction of Vijfhuizen. I know this area quite well as I often visit the plane-spotters area next to Schiphol’s Polder runway. What I saw from the plane window quickly came into view, except these weren’t tulips but fields of hyacinths. The weather was wild: within a short space of time, rain, hail and snow fell to the ground whisked around by high winds. Ever so often, the sun would pop out and the bright blue sky revealed itself. The contrasts between the vivid colours of the flowers and the dark threatening clouds were amazing! Despite the strong winds, the strong, sweet scent of the hyacinths filled the air! The fields of hyacinths with a massive cloud burst in the background. From here, I headed south towards the tulip areas around the towns of Hillegom and Lisse. Lisse is especially popular as this is where the world-famous Keukenhof gardens are located. The bright colours of the tulip fields soon appeared on both sides of the road as I approached Hillegom. I parked the car and went for a stroll around the fields, careful not to step on the rows of flower beds. I’ve seen this many times before but I’ll never tire if it! The fields in full bloom are just spectacular! Please refrain from touching, plucking or trampling on the flowers! The fields just outside the town of Hillegom. From Hillegom, I drove around, with no real direction in mind. It doesn’t matter as there are so many fields that you’ll spot them in any direction you drive, as long as you keep within the Hillegom-Lisse-Noordwijk axis (see map below). After circling the fields for a few hours, I drove towards the coast, passing the expansive dunes which form an important protection of the Dutch coast. I ended up at a beach café called Nederzandt at the end of the Langeverlderslag road, a loungy place for lunch. After a lazy lunch, I strolled down to the beach and watched the kite-surfers. It was a stunning sight and the kite-surfers happily showed off their moves to the small band of spectators. 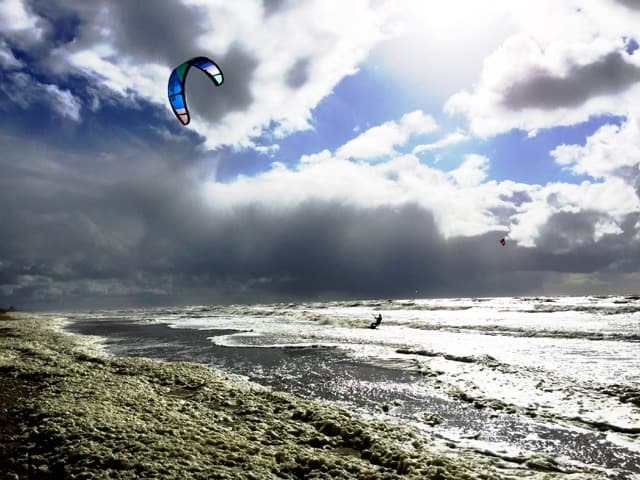 Kite-surfing along the Dutch coast on a stormy day. The kite-surfers entertained us with their skills. It was the perfect end to an amazing day! 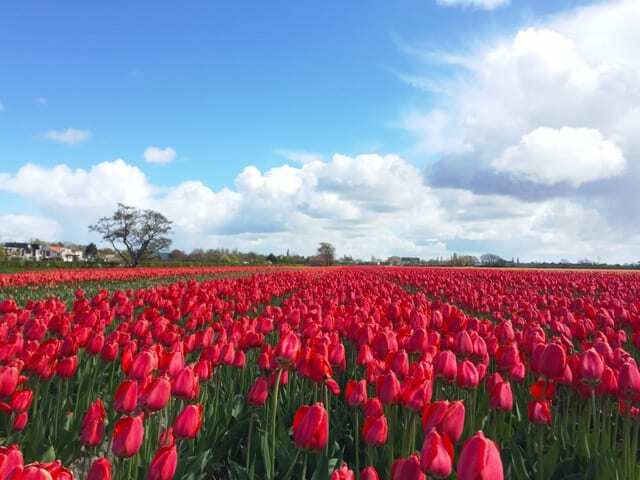 My favourite tulip areas are in the region north of Amsterdam but this region around Hillegom/Lisse is just as good, but with many more tourists – on sunny days, you could be stuck in a traffic jam around the tulip fields. They’re closer to Amsterdam though: about 30 minutes from the city and 20 minutes from Schiphol Airport. These photos are really lovely.Interesting post with these so colourful flowers.I really enjoyed reading the post. Thanks Shivya! 🙂 It sure was a stunning drive around the flower fields – my favourite thing to do in the spring in Holland! The wild weather sure made for beautiful photos! Those flower fields are always a wondrous sight! I’ll never tire of seeing them. Well, the wild weather made for some gorgeous skies… Those fields of tulips (and hyacinths) just seem to go on forever! Lovely!